Bury me in Kat Von D's Ink Liner. I was 12 years old when I tried to sneak out of my house to school with bright blue eyeliner on. Unfortunately for me, my parents didn't appreciate or understand my Britney-inspired ~lewk~ at the time and made me take it off. Tragic, I know. I share this story with you because I want you to understand just how much I love a good eyeliner. It's my favorite beauty product (always has been, probably always will be! ), and I feel like I've tried them all — even the cheap ones from Walmart when that was all I could afford at age 12. Well here I am, a grown adult who is willing to splurge on a product that rookie- and pro-eyeliner users alike are obsessed with. 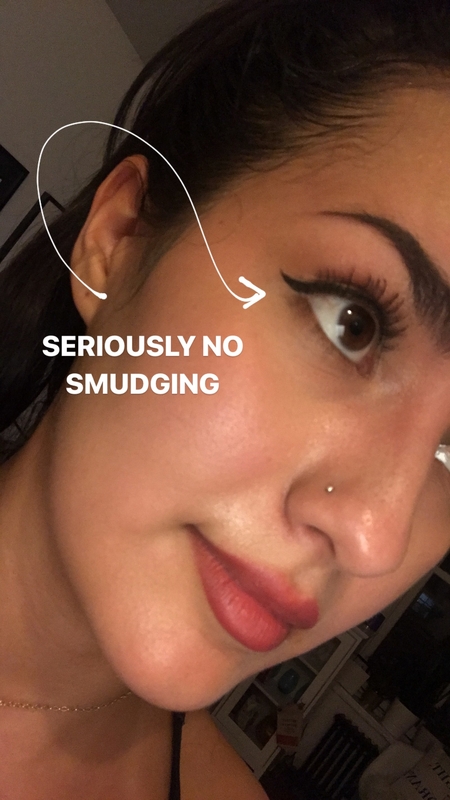 I am talking about Kat Von D's Ink Liner ($20; available in eight shades), and holy goodness it's *more* than what my preteen self could've dreamed of. What makes this liner so incredible is its felt-tip brush that offers super-crisp and richly pigmented lines that you could — oh, I don't know — casually execute the most perfect cat eye in BLUE with, even if liquid liners have never been your thing. And because Kat Von D is heaven-sent, this product is also vegan and cruelty-free. The Ink Liner is waterproof, and boy, does it live it up to that claim. I took photos halfway through the day and right before I washed my face so you could see just how well it stayed on. I walk a lot since I live in New York City and don't own a car, and, as pictured, this held up on a humid spring day. 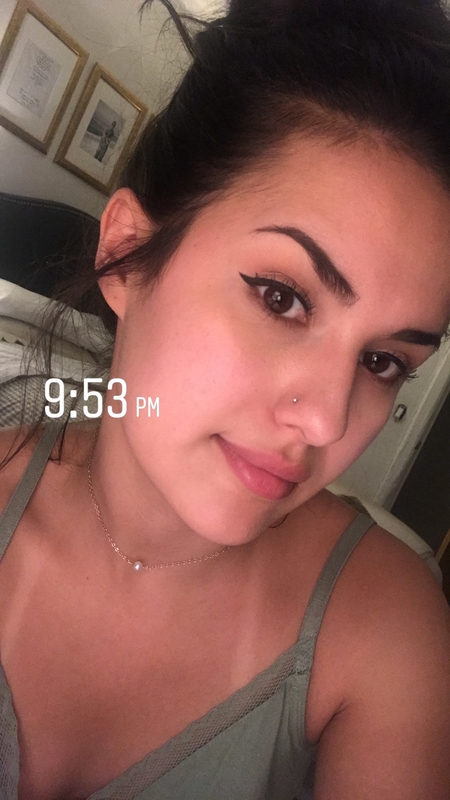 With other liquid liners I've experienced smudges and flakiness by midday — so the fact that this made it to my bedtime (14 hours AFTER application) without smearing is amazing to me. And washing it off is a total breeze, which I don't understand at all, but there's no fuss when removing it with makeup wipes or other cleansers. I have yet to completely run out so I can't speak on the life of one tube, but I've been using this daily for the past month and it feels as fresh as the day I bought it. If you look at the "How to Use" section of the product description on Sephora, it recommends blotting the felt tip with a tissue to prevent powder buildup, which can cause it to dry out faster. It also survived a full workday and then a workout, so IDK, this must be some type of witchcraft because that never happens with my other liners. I was a sweaty mess when I took these photos, so be impressed (with the liner, not my ability to barely work out for 30 minutes). I used to buy extra eyeliners to keep in my purse for touchups throughout the day, but since I started wearing this, I haven't had to reapply once. I even went to see The Avengers: Infinity War, may have cried at the end, so what, and this made it through that without bleeding into my muddled tears and slowly dripping down my cheek! 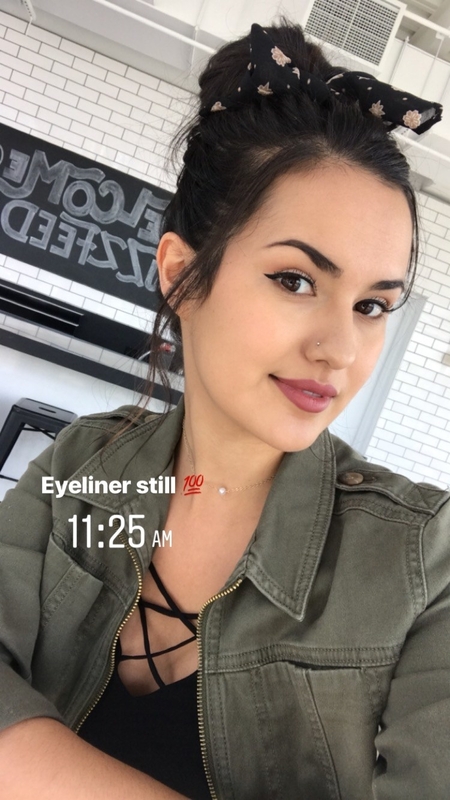 This magical long-lasting eyeliner is not only blessing me and my makeup game, but beauty stans of all levels out there. It has over 2,000 reviews and a 4.1-star rating on Sephora. 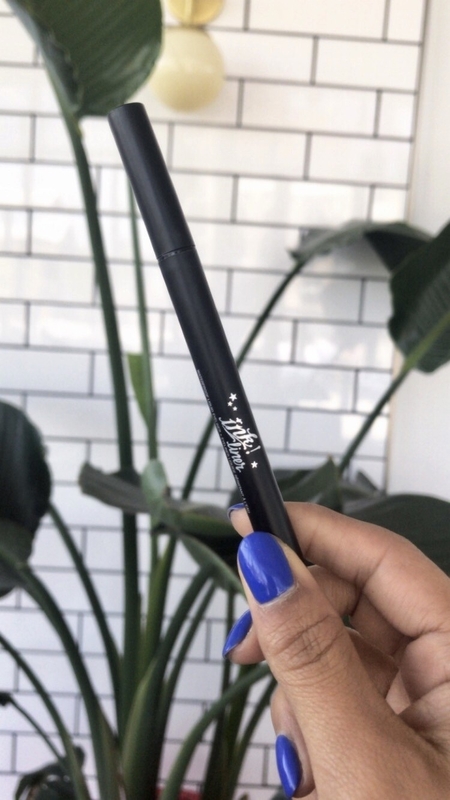 If you've heard of Kat Von D's Tattoo Liner — a product with a bit of a cult-like following — and are wondering how the Ink Liner differs and which one is best for you, then allow me to explain! The Ink Liner has a felt tip, whereas the Tattoo Liner is made with a brush tip. To expand on that, the felt tip on the Ink Liner quickly creates crisp, fine lines in an ultra-rich color — which is why it comes in eight shades and is great for anyone who has minimal experience with liquid liners. The Tattoo Liner, with its brush tip, on the other hand, offers more precision and has softer pigments so the lines aren't as harsh and it takes more of the product to build. They do have the same wear time and are both waterproof; it's the distribution of the liner itself that differs. If you're still thinking this is too confusing and I did a terrible job breaking that down, watch the videos that are on the Sephora product listing (or watch them on YouTube here and here)! Kat Von D herself goes through each product and their strengths. In short, this eyeliner is amazing and will withstand a breakup with your bestie, a breakup with your boyfriend, and turning down a trip to Paris. Get the Ink Liner (available in eight shades) or the Tattoo Liner (available in two shades) from Sephora, both for $20. And check out our pick for the best liquid eyeliner (and other beauty products) on BuzzFeed Reviews!